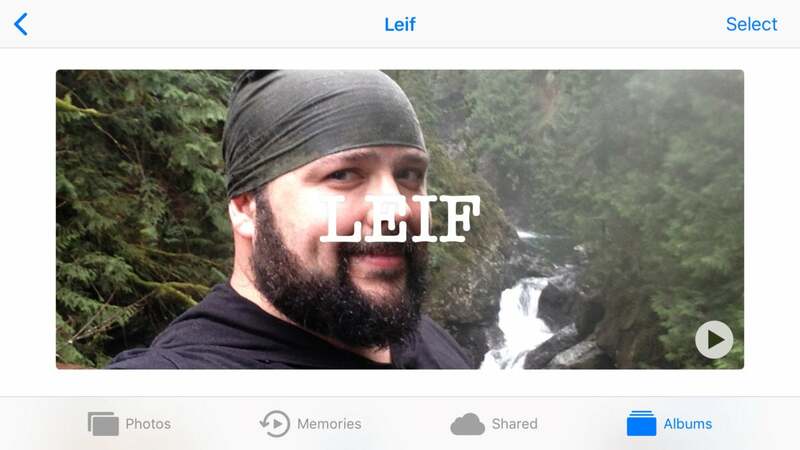 Make GIFs, salvage blurry photos, and label your friends with some of the lesser-known Photos features for iPhone. 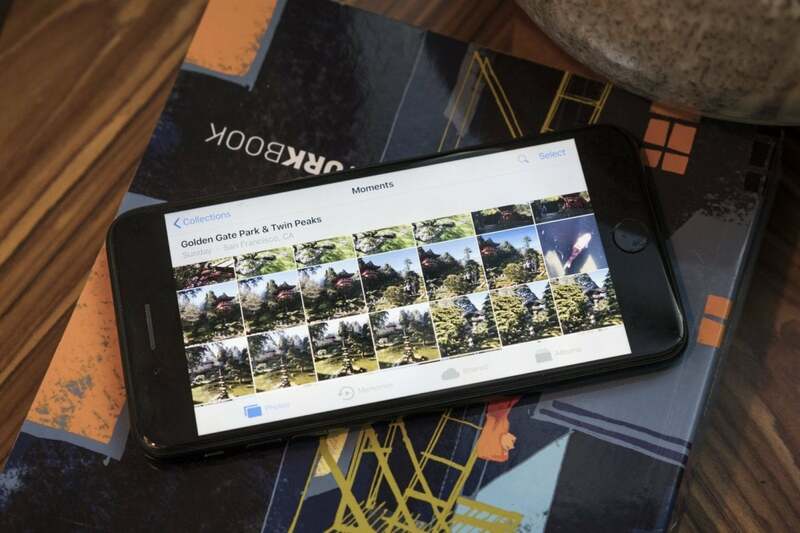 The Photos app in iOS looks like a simple thing: At first, you might even think it’s little more than a convenient dumping ground for sorting through your selfies and snaps. But underneath that minimalist exterior is an app that allows for a surprisingly wide variety of options, ranging from the ability to apply Instagram-like filters or to automatically categorize photos according to “memories” based on when and where you took them. These tricks are fairly intuitive to use, thanks to smartly placed options when you click the Edit button when looking at photos. Some of the most useful and interesting features, though, are a little trickier to find. We’ve compiled a few of our favorites here. Also, if you’re looking for tips on taking good shots to tinker with in the first place, be sure to check out our guide for using the iOS 11 Camera app. When Live Photos was introduced, they seemed like they were Apple’s way of capitalizing on the thirst for animated GIFs that tore across social media. Weirdly, though, Apple didn’t actually allow you to turn the images into GIFs until last year. Fortunately, those awkward days are now behind us. If you want to make your Live Photo a GIF, simply open the Photos app and select Albums on the toolbar in the bottom-right corner. From there, open the Live Photos album and select the photo you wish to transform into a GIF. All you need to do is swipe up on the photo (but not too low on the photo). From there, you’ll see a list of effects for Live, Loop, Bounce, and Long Exposure. Select Loop or Bounce, and then the image is automatically saved in your Animated album. Go to the new file in the Animated album, press the share button in the lower left, and send it to either your friends as an iMessage or email or to many social media platforms. “Many” is the key word. Instagram only lets you post “videos” that are longer than three seconds, so the Loop option with this method won’t work, but Bounce usually will. Twitter, though, apparently doesn’t want to play nice with Live Photos, so you’ll have to use a separate app to post them there. For most platforms, you should be able to post it just like any other GIF file. Hate it when a photo doesn’t turn out quite the way you intended, either because a bird flew in the way or the shot came out too blurry? You can often save your otherwise botched photo by selecting the preferred shot from the frames used to make the animation of a Live Photo. It’s a simple process. Just open an image in the Photos app, press Edit in the upper right (or bottom, if you’re using the camera app), and you’ll see a bar with frames pop up that resembles what you see when you’re scrubbing through a video. These are the frames that make up the Live Photo. Use your finger to scrub through all of the available frames and stop when you find an image that makes you happy. 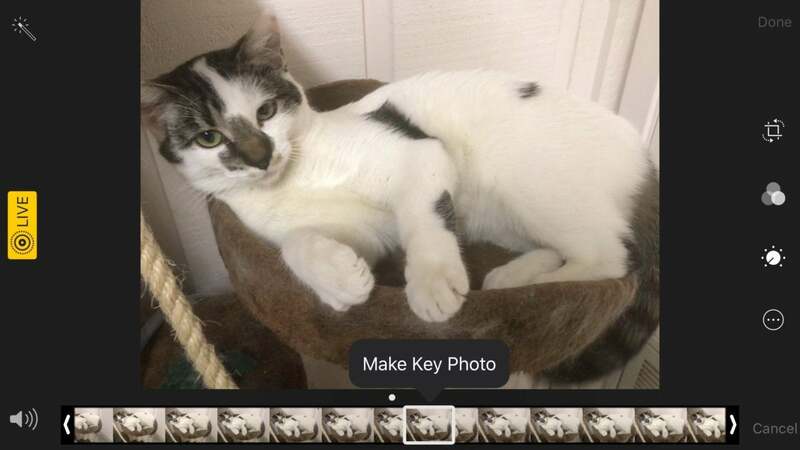 Lift your finger, and you’ll now see a Make Key Photo button over the frame you’ve selected. press it, and hey presto, that particular frame will now be the static image you see when you email it or post it online. Taking photos is so easy these days that it’s often better just to snap a shot of something a point out an important feature rather than describing it. And that’s where the ability to mark up photos through the Photos app comes in handy. Need to show late friends which seat you’re at in a large, crowded restaurant? Just snap a shot of the crowded room, draw a circle around your table in red, and text it to them so they’re not looking around awkwardly when they arrive. Apple makes this process easy. After taking a photo, open the Photos app—and remember, you can do this straight through the Camera app as well—and open the image you want to scribble on. Press Edit in the upper right, and then press the More Options button (the circle with the three dots) on the right side of the bottom menu bar that pops up. You’ll then see a Markup button. Press it. 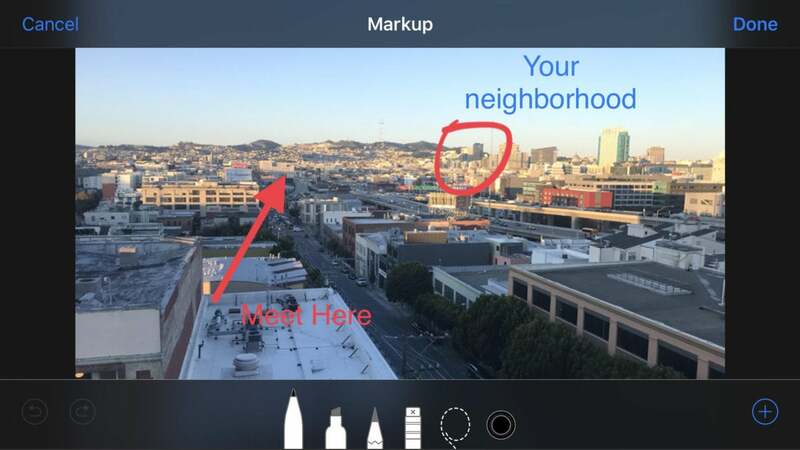 From here you can draw on your photos with tools that mimic marks from a pen, highlighter, pencil, or eraser in up to six different colors, and you can also use the lasso tool to move around your markups. For that matter, you can hit the plus sign on the right side of the bottom toolbar to write with straight text, use a magnifying glass, add a signature, or (very helpfully) add a huge arrow. 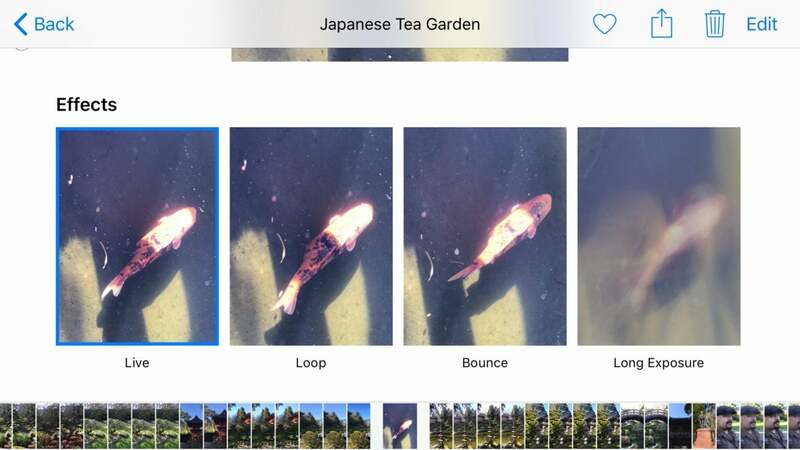 One catch: This feature disables Live Photos. You may already know that you can drag and drop photos from one album to another on the Mac or an iPad, but with a little bit of dexterity, it’s quite possible to do this on an iPhone as well. 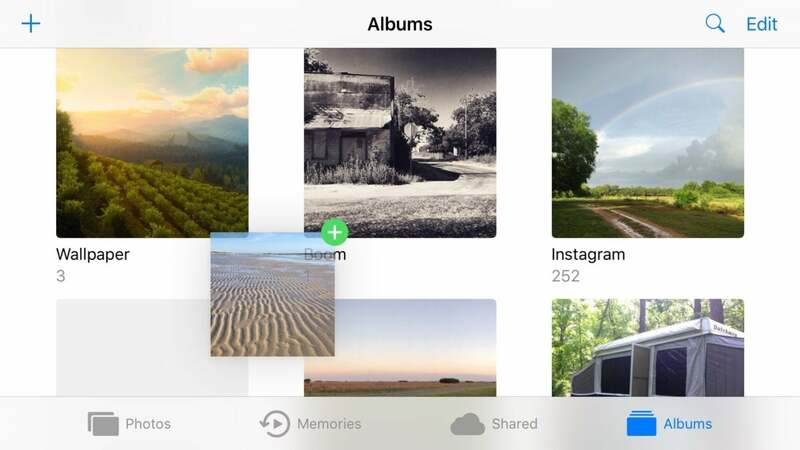 Find the photo you’d like to move to another album in the Photos app (so long as it’s in an album apart from automatically generated ones such as All Photos), and hold your index finger down on it while you’re still viewing the contents of the entire album. Don’t press down too hard, though, or you’ll turn on the Peek feature that makes it easier to view thumbnails. Once you’re able to drag the image around, keep pressing on your photo with the index finger and use another finger to press the Albums option at the top left. You’ll then be whisked back to the main albums menu while still “holding” the image with your finger, but now you’re free to drop it in the album of your choice. Then you’re done. If you start this process by hitting Select before you start pressing down on the image, you can even do this for multiple images at once. It’s arguably faster just to select the photos and then press the Add To prompt that pops up at the bottom of the screen afterward, but it’s nice to know the option’s there if needed. Apple’s Depth Effect feature shows up when you switch your iPhone’s camera to Portrait mode, and it’s a great way to deemphasize the background in a close shot without all the special lenses needed in the past. Before iOS 11, you had the choice of keeping both the Depth Effect photo and a photo without the effect in case one turned out better, but unfortunately (for your storage space), you now have no choice but to keep both versions. The benefit, though, is that sometimes the non-Portrait image sometimes comes out better and you can still access it if needed. That may not be immediately obvious. Only the Depth Effect photo shows up in your library now, but the normal photo is still there, hiding in its colorful shadow. Finding it isn’t too much trouble. 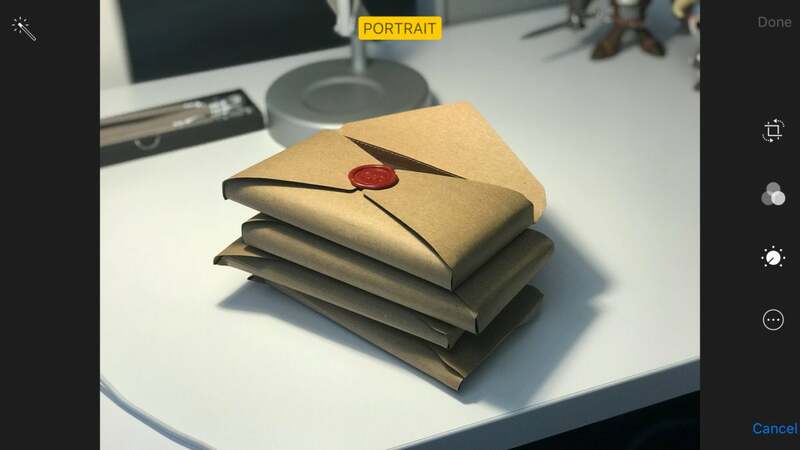 Simply open the photo you wish to have without the Depth Effect, press Edit in the upper-right, and you’ll then see the word Portrait at the top within a yellow bar. Press it, and the depth effect goes away. Once you press Done in the lower-right, the normal one becomes the main photo you see while swiping through your album. The Photos app already does a good job of spotting specific faces, but it usually won’t name them unless you specifically tell it to. To name someone so you can easily find them through the Search tool, go to Albums in the lower-right corner of the main screen, then hit the People album. You should then see that Apple has already grouped a lot of photos of what should be the same person. To name that person, press on their selection of photos and then press Add Name at the top of the menu that pops up. Then enter their name, press Next in the upper right, and you’re done. If you want to add additional photos of that person that iOS isn’t too sure about, scroll down to the bottom of their collection of photos and select Confirm Additional Photos. 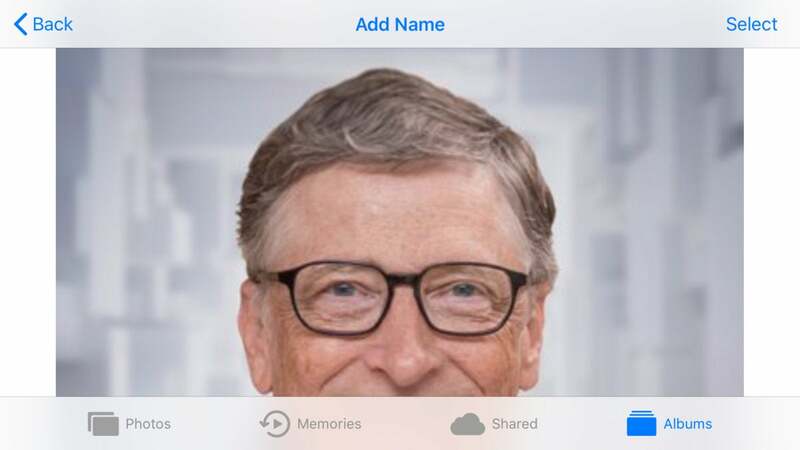 The Photos app will then allow you to confirm whether the following photos are the same person. Bad memories? You can also remove folks from recognition in the People album by opening the Photos app, hitting Select in the upper right and then choosing the person’s profile, and then press Remove in the lower left. At the other end of the social spectrum, you can mark them as a favorite through the same menu by pressing the next option to the right. Sometimes you’ll find that Apple hasn’t recognized any of the photos you’ve taken of someone, so they won’t show up in the People album. This usually happens when you haven’t taken enough photos for the facial recognition feature to build a workable set of data. You can easily work around this. Just open a photo of the person you wish to add, and then swipe up on the middle of the photo. Yep, you might remember this screen from making GIFs. Scroll down past the Effects options foir making GIFs, and you’ll see another heading for People. Press on it, and then press Add Name at the top of the new image. Add the name, press Next, and you’re done. You’ll now be able to see the person in your People album. You probably already know that you can easily turn one of your photos into a wallpaper for your iPhone, but you may not know that you do the same thing for your Apple Watch. If you’re not familiar with either, the good news is that it’s essentially the same process. You’re just selecting a different option. Open the Photos app and find the photo you want to turn into an Apple Watch photo watch face and open it. You’ll then press the square options button in the lower left, and you should see a bottom menu that pops up with the option to Create Watch Face. Select it, and then you’ll have the option to see the photo on your Apple Watch in either Photos or Kaleidoscope view. 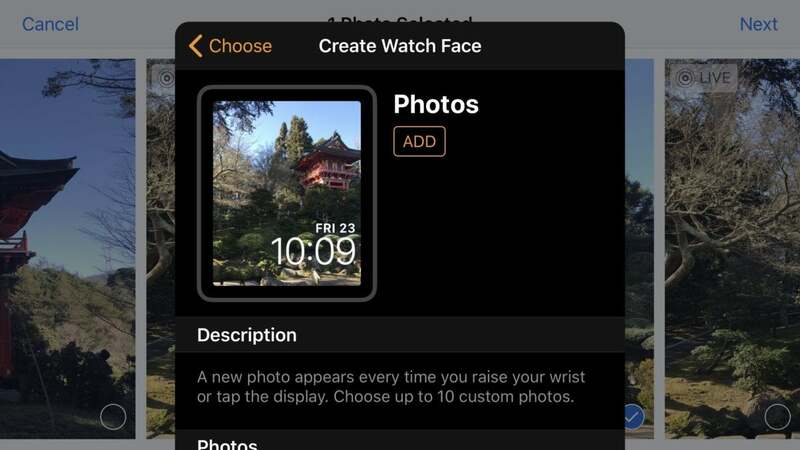 Once you’ve made your selection, press Add on the screen that pops up and the new image should show up immediately on your Apple Watch regardless of which watch face you were using before. Sometimes you’ll have to crop the image in the Photos app first for the best fit, but overall it’s a painless process that adds a bit of personality to your Apple Watch. You’ll even get two complications to tinker with on the photo watch face itself.